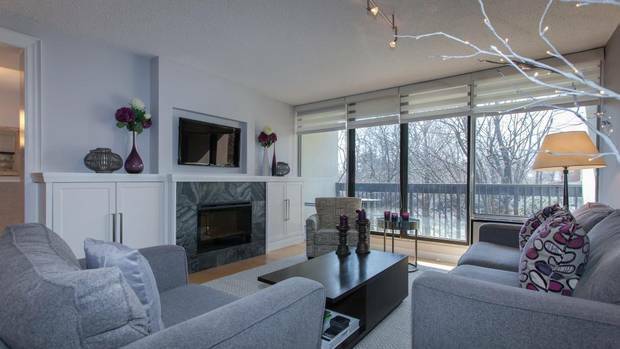 The Action: A small number of units were up for sale at Bayview Place in Willowdale, but the sellers of this three-bedroom suite only had to open their door to 20 buyers to find one who negotiated an offer. What They Got: In a complex with a trio of mid-rises, this more than 30-year-old suite has a 1,130-square-foot plan with classic maple hardwood floors and a fireside living area along sliding balcony doors, plus a master suite with a walk-in closet and one of two bathrooms. All other comforts are provided in a renovated kitchen with stainless steel appliances, a laundry room and ensuite locker, plus parking. Monthly fees of $631 pays for utilities, cable and pool. says agent Jennifer Palacios, who sold her sister a unit in the complex for that reason. This unitâs mix of urban and rural elements was another benefit.